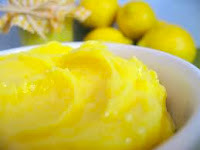 My last post on Lemon Pie made from fresh Louisiana lemons created quite a stir. (no pun intended!). I received many comments and some recipes for further use of this seasonal (for us) fruit. I believe the variety of lemon is Meyer, but am not sure. That seems to be a common variety that grows well in our climate. This post is dedicated to the further use of the quart of lemon juice we still have in our refrigerator. 2. Combine sugar, flour, pinch of salt, melted butter, lemon zest and lemon juice. 3. In another bowl, beat egg yolks and then add yogurt and milk. 4. Stir in lemon mixture and then fold in egg whites. 5. Pour into a greased 8" by 8" baking dish. 7. Bake at 350 degrees F for 40-45 minutes. Best served warm with whipped cream and fresh berries. Another use for all that lemon juice was sent by my cousin Melanie Mitchum. She offered it as a simpler method to my Lemon Meringue Pie. I haven't tried it yet, but wanted to share it with you. In her words: "That's it! Super easy and really delicious!" Melanie adds that when her husband, Mark, prepares it, he doubles the filling recipe to make the pie extra thick. 1. Stir all ingredients together and pour into a graham cracker crust. 2. Bake for 15 minutes at 350 degrees F or until pie is "set" and egg yolks have cooked. 3. Chill before serving with dollops of whipped topping. 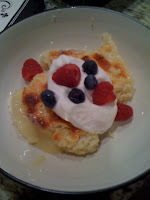 The last recipe I will share with you was given to me by my friend, Lydia Cook. Lydia and I have known each other for years, and have since reacquainted through the Third Tuesday Book Club of which we are both members. At our club's recent Christmas lunch, Lydia brought this recipe to me. She had read the blog about Lemon Meringue Pie and had this recipe that also features the bountiful lemons. Haven't tried it yet, either, so am picturing it with a version I found on Google Images. It's Sue Tweedy's Lemon Curd. The making of Lemon Curd is not uncommon as I also had some earlier in the year that was prepared by my friend, Kaye Hurst. Hers was delicious, so I am anxious to try this. 1. Combine all ingredients in the top of a double boiler saucepan. 2. Cook on medium heat, stirring constantly for about 20 minutes or until thick and smooth. 3. Refrigerate and use as desired on scones, biscuits, pound cake, etc. Now for the Lagniappe. 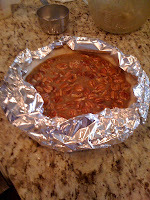 In another post I mentioned "tenting" a pie crust with foil. Several readers contacted me to know more about the tenting method. It is used to prevent excessive browning of a crust while a pie is baking. Estimate a length of aluminum foil about half the circumference of the pie. Tear that length in half. With the shiny side out (to reflect heat best), shield the crust of the pie. When there is about 15 minutes of baking time left, remove the tent to allow the crust to brown. Thanks for reading and Merry Christmas! My helper was busy today learning to play the piano with her Paw Paw, so she didn't assist me with this post. Thanks for reading and hop to the kitchen! More books to write and you must test all the recipes, T-M! Thanks for adding my recipe. That was nice. I always enjoy reading your blog. I especially like the picture you added of your husband with Olive. So cute! Thanks to all of my readers! I appreciate all the emailed and FB comments, too, and treasure your friendship.